GALION — Galion High School’s Cross Country Festival is being ran today for the 41st time at Amann Reservoir. The running starts at 9 a.m. and continues through 5 p.m. when the the Division I high school girls open race begins. Also running this year is Colonel Crawford’s Chad Johnson, who owns the best time in the nation this year in the 5,000 meter (3.1 mile) race. His winning effort of 14:54.86 is the best this year in the USA according to the website ohmilesplit.com. The website’s Phil Grove, who coincidentally is a former sports and news editor at the Galion Inquirer, interviewed Johnson recently. You can see that interview here. Johnson and his teammates, Northmor and Crestline run at 1 p.m. in the Division III race. Galion’s boy team takes to the turf at 1:30 p.m. in the Division II boys race. The girls teams for Northmor, Crawford and Galion run at 2 p.m. in the Division III race Galion’s girls team runs at 2:30 p.m. Admission Saturday is $5 for anyone 13 and older. Those 12 and younger get in free. This year’s field includes nearly 100 teams, a far cry from the five teams who competed in the very first meet in 1977. 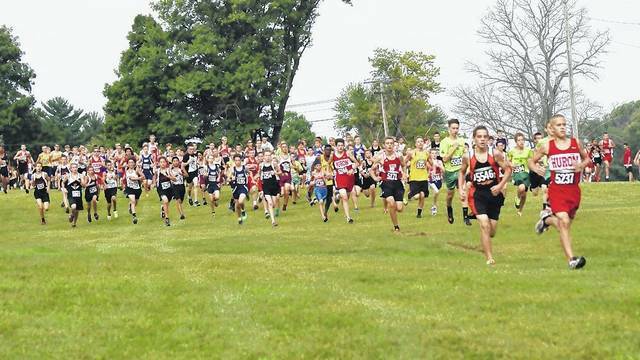 With more than 4,300 competitors in four categories (high school boys and girls, and middle school boys and girls), the Galion Cross Country Festival is the third largest such meet in Ohio. “The Galion Cross Country Festival has a very storied history,” said Festival Meet Director Ken Jarvis. “The course at Amann Reservoir is probably the best spectator course in Ohio. Notable athletes who have run in the Galion Cross Country Festival include: Scott Fry, a state and national champion in both track and cross country; Clair Durkin, a state champion who ran collegiately at Stanford; Bob Kennedy, a state and national high school champion, a national collegiate champion, and a U.S. national record holder in the 3,000 meter, two- mile, and 5,000 meter runs, and two-time Olympian; and Andrew Jordan, named by Ohio Mile Split as Best Distance Runner ever produced in Ohio and two-mile national champion. Jarvis has personally overseen the organization of the meet for more than 30 years. His vision and work ethic has helped make this festival one of the most competitive in Ohio. For more information about the event, including a map of the course, spectator parking information and more, visit www.galionschools.org. Courtesy photo More than 4,000 runners will converge on AmannReservoir outside Galion for the 41st Galion Cross Country Festival on Saturday. https://www.galioninquirer.com/wp-content/uploads/sites/38/2017/09/web1_galion-xc-festival.jpgCourtesy photo More than 4,000 runners will converge on AmannReservoir outside Galion for the 41st Galion Cross Country Festival on Saturday.